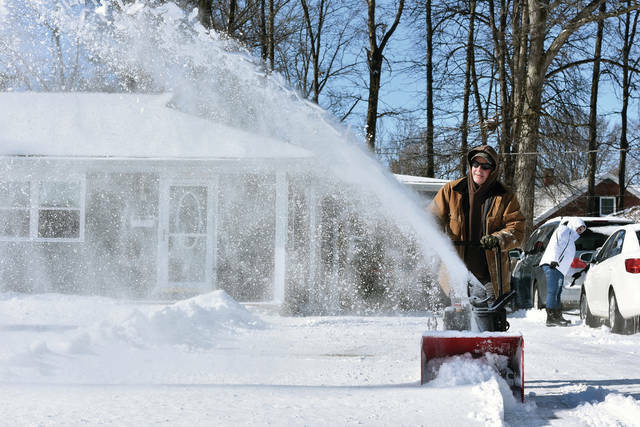 Rodney Hughes, of Sidney, clears his driveway of snow along Main Avenue, Sunday, Jan. 20. 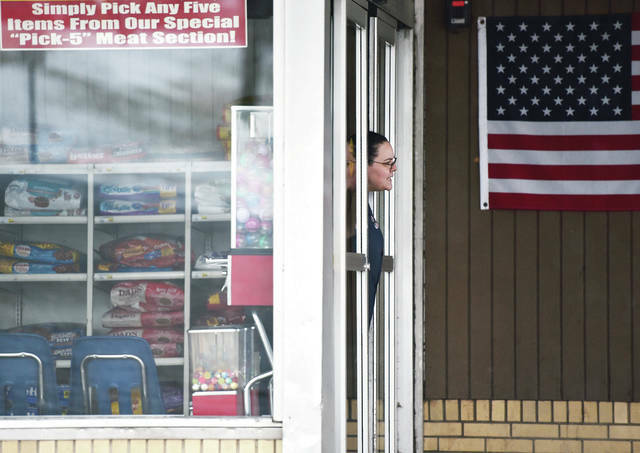 Natasha Tittle, of Sidney, pokes her head out of Sidney Foodtown to tell people that the grocery store is closed due to a power outage that started around 12:30 p.m. Saturday, Jan. 19. The power had been out for 45 minutes as of 1:15 p.m. The traffic lights in front of the store had also lost power. A city of Sidney plow clears the intersection of Main Avenue and Robinwood Street as ice-covered trees glisten in the background Sunday, Jan. 20. 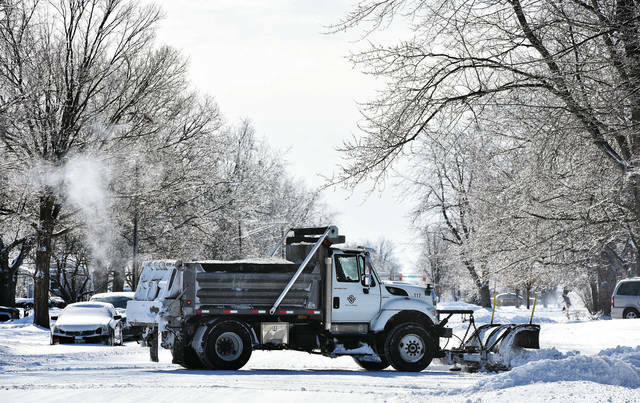 SIDNEY — The anticipated weekend winter storm dropped freezing rain and 4 to 6 inches of snow on Shelby County starting Saturday, Jan. 19. The Ohio State Patrol (OSP) and Sidney Police Department said no significant or life-threatening crashes occurred on the roads after the storm rolled in. The Shelby County Sheriff’s Office’s reports indicate numerous vehicles went into ditches, and there were several crashes in the county on Saturday and Sunday, including three roll-over crashes. OSP Sgt. David Robison said the OSP responded to 13 crashes, Saturday. Although some people were injured, he said, “nothing life-threatening” occurred. Sidney Police Officer Jeremy Lorenzo said surprisingly there were not a lot of crashes in the city of Sidney. “Not a lot of crashes, and that’s good news. The roads are obviously still really slick. They are packed down with snow and very slick because the salt won’t work (due to low the temperature). We are recommending for people to use extreme caution when getting out,” Lorenzo said. Over the course of the weekend, DP&L reported a total of 31,000 customers lost power in their service area, which includes 24 counties. But the northern counties, including Shelby County, were most affected, Mary Ann Kabel, director of DP&L’s corporate communications, said. A total of 5,510 customers in Shelby County lost power over the weekend, Kabel said. On Saturday, at 11 a.m., 310 customers lost power, and between 2 and 3 p.m., another 5,200 lost power. Kable said most of those customers regained power within two hours, and the remaining almost 900 customers were reconnected by 4:30 p.m. Saturday. She noted, however, there were sporadic outages throughout Saturday evening as it became colder across their entire service territory. National Weather Service Meteorologist Kristen Cassady said the low temperature in Shelby County since Saturday was -5 to -8 degrees, Monday morning. The cold air moved in after the precipitation, she said, noting that the temperature had been much warmer during the weekend. Cassady confirmed that Shelby County received 4 to 6 inches of snow after freezing rain which fell before the snow moved in.